Moab, Utah isn’t the type of place where man can thread lightly. Mountains, deserts, trails and the Canyonlands National Park are pretty hard to tackle without the right 4x4 machine. For this reason, an iconic brand uses Moab to showcase how off-road capable a Jeep is. For the 49th Annual Easter Jeep Safari, the Fiat-Chrysler Automobiles-owned company made no less than seven concept vehicles. That’s one up over last year’s six and trust me - the seventh dram machine is the one that really counts. Baptized Jeep Chief Concept, this offroader has what it takes to climb every mountain and ford every stream. Inspired by the classic, original Cherokee, the Chief is also a nod to the west coast surfer lifestyle, mostly because of that Ocean Blue paint and white French Bread roof. Some may be tempted to call the Jeep Chief as being... ahem... groovy, but then you look at the a custom modified razor grille made famous by the Wagoneer. Speaking of the old-timer, there’s a new Jeep Grand Wagoneer in the pipeline. 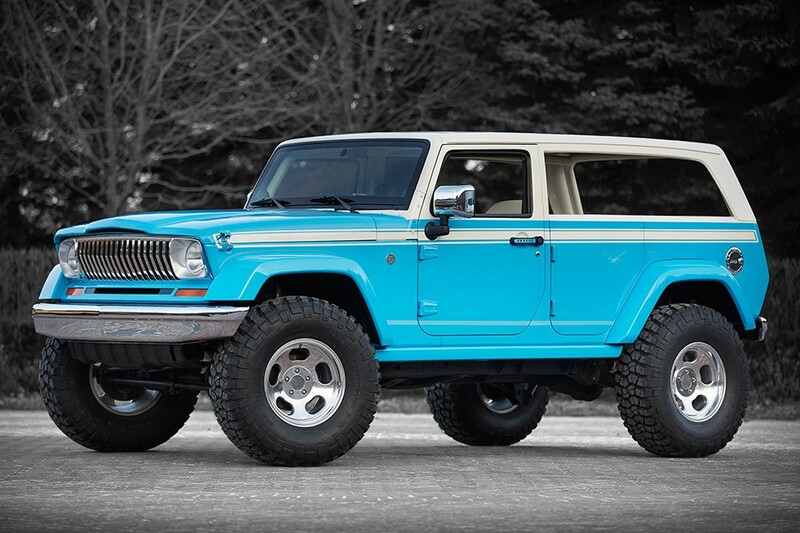 Now back to the Jeep Chief Concept. 17-inch slotted mag wheels are on the menu as well, joined by Surfer pink, blue and white flowered cloth and leather-trimmed seats on the inside. This is where it gets kind of too vintage: surf stickers on the center console, a Rosewood front-passenger grab handle and a tiki-style shifter handle are other highlight cabin details. Regarding the oily bits, things can be summed up as same old, same old. A two-inch lift kit with Fox shocks and front and rear Dana 44 axles with lockers enhance its off-road capability, while a 3.6-liter Pentastar V6 mated to a 6-speed stick shift take care of propulsion duties.